Indonesia is huge, and as the largest archipelago country in the world, it is not easy to choose which island to visit especially when we have limited vacation time. This issue also shared by scuba divers who wish to dive in Indonesia. The country offers numerous islands to dive. They are equally beautiful, but there are some destinations that outstanding and worth to visit (and revisit). Allow me to introduce the first top five destinations in Indonesia. I have visited three destinations from the top five and to witness the beauty of our ocean directly always made me happy. Following is the top five destinations, listed based on the alphabetical order. Located near to Timor-Leste, Alor Island, and its islets are not easy to reach. First, you have to fly to Kupang, the nearest big city on Timor Island. Then from Kupang, you still have to continue the journey of around 20 hours by car-ferry to reach Alor. Finally, Alor’s airport opens in 2014, thus for travelers who have limited time can reach Alor from Kupang in just one hour. Why Alor? Solitude white sandy beach; unique culture and tradition; mountain and hills for hiking and pristine coral reefs with a great variety of marine life from nudibranch to Hammerhead sharks. The sight of schooling of Hammerhead sharks was reported by a scuba diver in ScubaBoard forum: Hammerhead and Manta Ray Dive Sites in SE Asia. Aside to Hammerheads Sharks, dolphins, and blue whales are occasionally seen. Some dive sites have volcanic sands to do muck diving where the Rhinophias, nudibranch, and other amusing critters are spotted easily. 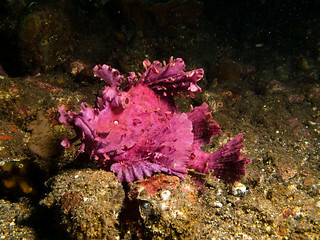 Alor is also home to various species of Rhinophias-scorpionfish, a rare fish species. At least four from six Rhinophias species can be seen in Alor. When is the best time to dive into Alor? March to December with April to September for possibilities to spot Hammerhead sharks (sharks diving could reach to below 30 meters deep) and Blue whales. Avoid January and February due to weather condition. Where to stay and dive in Alor? Scuba diving Liveaboard (dive and sail by ships) or dive resorts. There are several dive resorts in Alor Island and its islets. The prices at dive resorts are cheaper compared to Liveaboard. Bali is already well known for rich traditional heritage; beautiful temples; unique nature and wildlife; and its beaches are littered with surfing spots. In addition to these, its underwater life is impressive, not only for scuba divers but also for snorkelers. Why scuba diving in Bali? Manta Rays and the heaviest bony fish in the world, Mola-mola (Sunfish) are regular visitors in Nusa Penida and Nusa Lembongan. Bali sea also has shipwreck from World War II in Tulamben that covered by colorful corals with turtles and clownfish as the shipwreck guardians. For those who love to see the alien-looking critters like the harlequin shrimps can spend diving in Seraya and Amed. The healthy corals could be enjoyed in Menjangan-Buleleng. Additionally, you can dive in Pemuteran to see the inspiring Balinese environmental marine projects, “The Underwater Temple Garden” and “Biorock Gardens.” The gardens and the statues are now covered by corals and home to numerous marine life. When is the best time to dive in Bali? Scuba diving is possible all year long. However, from mid-December to the end of February is rainy season and it may affect the visibility and access to certain dive sites due to choppy sea waves. Mola-mola season in Nusa Lembongan starts in July until September. Sometimes Mola-mola has still stuck around until October. Meanwhile, Manta Rays can be seen all year long, they are always available in a dive site called as Manta Point, it is near to Nusa Penida. Where to stay for diving in Bali? Dive centers in Bali usually offer hotel pick-up service, in this way you can stay at accommodation of choice in the South or East part of Bali. However, do consider that the farther you stay from the diving location, the earliest you have to start the trip to reach the diving location. Dive resorts and private villas to accommodate scuba divers are also available in Amed, Candi Dasa, Padang-Bai, Pemuteran, Tulamben and Menjangan. This is Dutchie’s most favorite diving destination. Komodo National Park is vast; it is listed as UNESCO Heritage with the total size of 219,322 hectares (includes the marine area). The park includes the two huge islands: Komodo and Rinca Islands, which are the habitat of the Komodo dragon, the largest lizard on Earth and many uninhabited islands and islets. Komodo Islands have savanna ecosystems and interestingly they are all within the active volcanic ‘shatter belt’. Diving with Mantas in Komodo! Why is Komodo diving so unique? The islands of Komodo and Rinca form a bottleneck passage between the Indian and Pacific Ocean currents (source). The lack of passage caused many types of currents during the tidal changes from south to north or vice versa, and that includes the whirlpool current. The currents usually attract fishes especially the pelagic. Komodo also has cleaning station areas where manta rays usually hang out with their buddies. Scuba divers can dive as well under an active volcano, Sangeang Api. The dive sites have the black sandy bottom with the bubbles rising from the hot springs. From what I have heard, there are lots of interesting and weird marine life in the volcanic areas. When is the best time to dive? March to October are the recommended months. Manta rays season is October to April. I was diving in December, it was off season but the diving was still great, and we were diving with around 14 manta rays in one dive site. However, due to the rainy season and choppy sea waves (December to February), some dive sites were unable to access. Where to stay for diving in Komodo? There are three options: (1) Liveaboard sailing ships; (2) hotels in Labuan Bajo with local dive centers and (3) dive resorts in several small islands near to Labuan Bajo. Liveaboard is more efficient as some dive sites are very remote. Maluku or internationally known as the Moluccas is a group of islands in the Banda Sea, the Eastern part of Indonesia that used to be under four Kingdoms. The diving destination in this area called as the Forgotten Islands by Liveaboard companies because the islands are undeveloped, distant from population centers and far off any beaten path. Why visiting the Forgotten Islands? Its remoteness makes the location very special for adventurous travelers who love the ocean and the unknown cultures. Banda sea offers healthy reefs with amazing walls diving, impressive sea fans and sponges, and abundant fish. A scuba diver in ScubaBoard Forum wrote a review of some dive sites in Maluku: “My favorite places were ‘Lava Flow’ – an underwater hilly landscape with extremely dense hard coral covering, ‘Batu Kapal’ – underwater pinnacles with massive amount of fish and abundant moray eels and ‘Pulau Hatta’, where we saw our first hammerhead sharks.” Meanwhile, in Ambon, the most developed city in the Maluku region is known to have amazing diving for scuba divers who love small critters. When is the best time to dive? March, April, and September to December. Avoid January, February, May, June, July, and August since there are often inconsistencies of the weather condition that may cause cancelation in ferry schedule or flight between the islands; unless you have extra time to travel in this region. Where to stay for diving? There are not many diving resorts and dive centers in Maluku due to its remoteness. Few dive centers and resorts are available at Weda Bay (Halmahera); Ambon Bay; Saparua Island; and Banda Island. Another option is to dive into the Liveaboard sailing ships. Located in West Papua, Raja Ampat is, without a doubt, the best diving region Dutchie and I have ever dived. Not only for diving, but its region is also still pristine with abundant natures and unique people traditions. Why had Raja Ampat? World Wide Fund for Nature called Raja Ampat as the Richest Coral Reef on Earth after a research resulting the region is home to 75% of coral species of the world. Not only that, we have been diving in several dive sites where the walls were covered by millions of glassfish with abundant numbers of fishes that we could not even see the walls because they were just too many! Raja Ampat also a sharks and rays sanctuary where all species of sharks and rays are protected from any type of fishing. Manta rays and sharks are frequently seen in this region in a natural way – without shark feeding practice! The coolest and not dangerous shark I have ever seen in Raja Ampat is the walking shark (the Epaulette – long-tailed carpet shark). It usually can be seen during night dive. When to visit Raja Ampat? September to May is perfect months to visit Raja Ampat. June to August is a rainy and windy season, and most dive resorts in Raja Ampat stop operating. Where to stay for diving? There are dive resorts in small islands in the South and Central area of Raja Ampat. Ideally, it is best to visit Raja Ampat by liveaboard sailing ships due to its wide range of diving areas and remoteness. More tips on Raja Ampat, please visit Raja Ampat Itinerary: Thoughts and Tips. Hiding from bubble maker monster! There are more amazing diving destinations in Indonesia such as the Derawan Islands in Kalimantan – where you can swim with non-stinging Jellyfish in Kakaban Lake or Sulawesi Island like North Sulawesi, Gorontalo, Togean Islands, and Wakatobi; where the dive operators are more established and also easier to access. These places deserved a special post in the future! 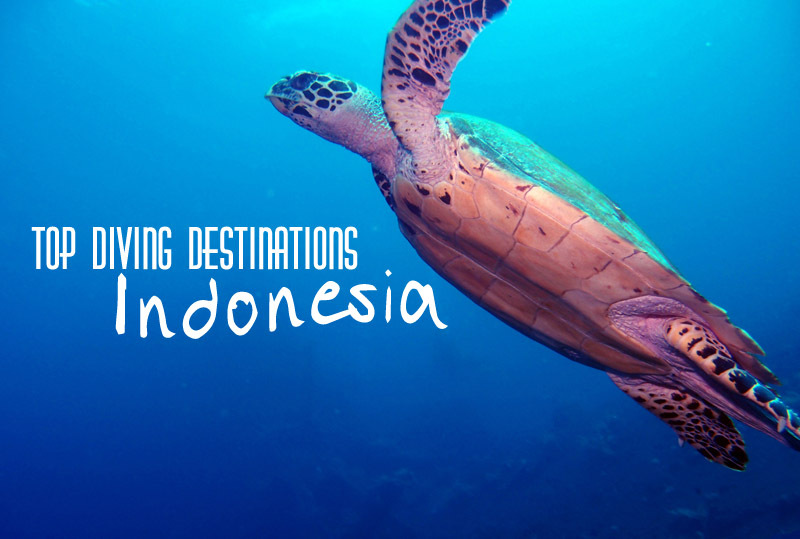 Please help us in deciding the next diving destination in Indonesia! Dutchie and I could not decide where to dive in Indonesia for November’s travel. It is already mid-October and we still haven’t booked diving package and flight tickets. Would you please help us by voting for where should we dive in November? All of these are on my list!! Fantastic photos. Lima dulu untuk kali ini. Indonesia memang banyak lokasi top buat menyelam. Terakhir saya ke Bunaken banyak sampah dan minyak mengapung di sana. Masih menunggu berita apakah ada perbaikan.